It was one afternoon, when my daughter who was reading a book, asked me what does in year circa … something meant. I told her it meant so many years after Christ. That’s when Aunt Vimala asked me, are you sure? Well I was not, when Aunt Vimala wags a finger the tough get shaken. So I quietly looked up what circa meant. Circa — at, in, or approximately used usually in reference to dates. 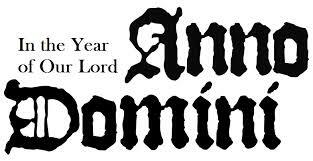 AD — Anno Domini– in the year of our lord.– medieval Latin. BC for me always meant before coffee, but Merriam Webster says, it is. “After Death” chorused the class again. “From Mr. Fernandes “ well he was the other history teacher. At the staff room, Aunt Vimala asked,”Mr. Fernandes, what does AD mean” in all innocence. “Attention Deficiency”pat came the answer, of course Mrs.Bharve knew that Aunt Vimala had something up her sleeve, just then Mr.Hegde the school trustee came in, and Mr.Fernandes, decided to have fun at my Aunt’s expense. “Sure, Authorized Dealer” replied Mr.Hegde without even pausing to think. after all Mr.Hegde was a business man. By this time Aunt Vimala could not control her laughter, she told Mr.Hegde and Mrs.Bharve the context in which she asked the question and of course set Mr.Fernandes right. ha ha.. I remember our history sir explaining us about AD as Ann Domini and not what it is thought in general, certainly we were shocked then.